Back in the day (the day of the Contract With America) I got to go into the office of the Speaker of the House and do an interview with Newt Gingrich, for a story on a photographer who had documented the new speaker's "First Hundred Days." Sitting right there in the office, in a glass case, was the huge skull of a T Rex. It was behind me, but at one point in the interview - mid-sentence - Newt leaned around me to look at the skull admiringly. "Man I love that thing," he said. 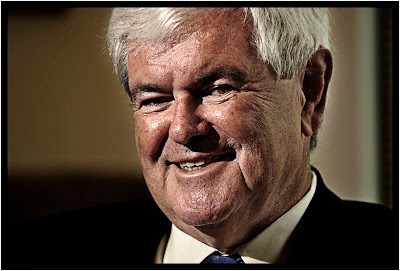 Now Newt's out of that office and running for another. On an assignment to photograph him recently I found his new office on K Street had no dinosaur skulls, but lots of other dino memorabilia. It seems a risky symbol for a Republican presidential candidate, but then Newt never went out of the way to be politically correct. This past month was the hottest July on record in DC, the warmest in 140 years of record-keeping. Yet, following a trend that's been noticeable all year, the streets had a steady stream of people on bikes. Six months ago I grabbed a video camera and interviewed cyclists who were out in snow and sleet; so this month I filmed their hot-weather counterparts. If you ask these riders why they do it, they first talk about practical reasons - convenience, environment, fitness, speed. But if I listen a bit longer I notice one word keeps cropping up: "Freedom." 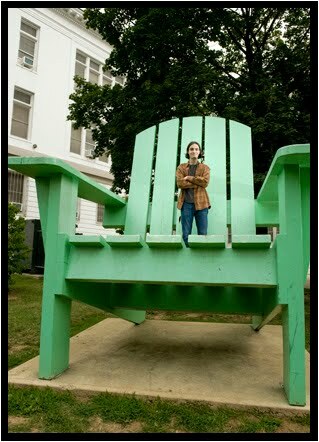 Well no, it's a perfectly normal-sized teen (and not a Photoshopped photo either). But when we visited the front lawn of his old high school in DC, with its giant lawn chair, and he climbed up, the effect was surprisingly Lilliputian.